The fragment has a band, an inscription, and two identical birds, block-printed in black outlines. The band has linked hexagons with green frames and borders of oval medallions. The birds, inscription, and band also all show remains of painted gold. The inscription probably reads "al-mulk lillah". There is an open seam at an angle to the printed design. 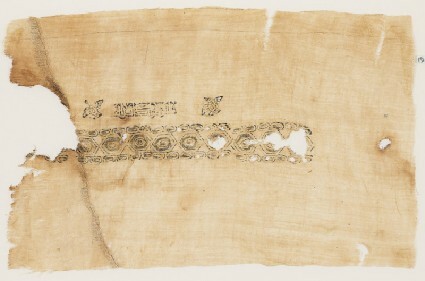 The original accession card states that the textile is from 11th century Iraq.